A closer look at the original hilt fittings reveals that they are of the finest quality. The pommel is 1.55 inches long and 0.7 inches at its widest. It has 53 garnets inset in delicately curving cloisonné cells made of gold 97 per cent pure. It is of the early ‘cocked hat’ type and its closest parallels have been found in what is now Sweden. The grip of the hilt has not survived, for it was made of some organic material, probably wood or horn. Its approximate shape can be estimated by the pair of gold filigree clips which fitted around three sides of its top and base. Organic material, again probably of wood or horn, also formed part of the crossguard, but the gold plate fittings (between 91.7 and 93.5 per cent pure) which enclosed it are 2.6 inches across. Either side of the top of the scabbard was found a perfect pair of mounts shaped like flat topped pyramids. These really are wonderful little objects, just under half an inch high and three quarters of an inch across, each inset with 110 inlays of garnet, blue glass and millefiori; the gold cells and bodies are made of 20 per cent silver and 77 per cent gold. We can get some idea of the incredible skill involved in the making of these items if we look at the top corner stones and remember that the whole pyramid is under half an inch across. 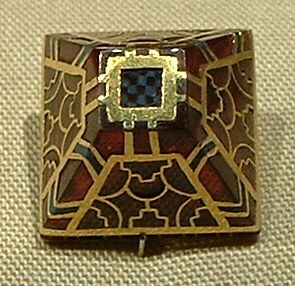 The upper corner garnets, for example, are facetted and fitted with complete accuracy along three planes at a scale of less than a tenth of an inch square. The question again arises as to how the individual garnets were cut so cleanly at so small a scale. Garnet is extremely hard – so hard, in fact, that it is used as an abrasive today. How the jewelsmith in coordination with the goldsmith achieved such perfect precision with so difficult a medium at so delicate a scale remains a mystery. The possible existence of a short-sighted master-craftsmen has been suggested. The Old English themselves probably believed that such wonders were the work either of the elvish super-smith of the gods, Wéland (or Wayland), or of the race of dwarf-smiths known as the Brosings (referred to in Beowulf, ll.1197-1201), who were said to be capable of making magical treasures. Underneath each mount are neat slots in the gold bases where some sort of ribbon or strap would have passed through. 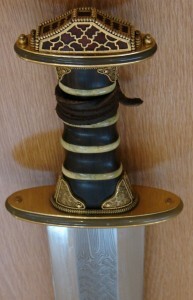 This point and the position of the mounts as found (in the ground either side of the top of the scabbard) implies that they probably adorned the sword-knot. This was used to secure the sword in its scabbard by means no doubt of some special knot. 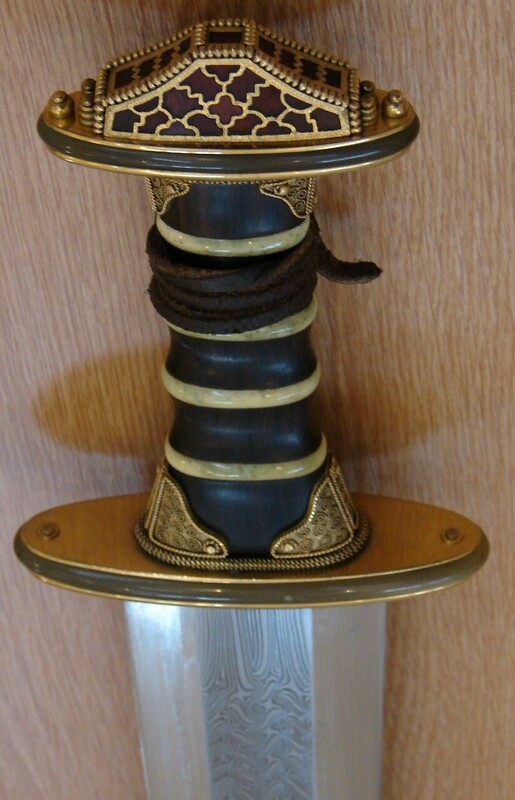 Symbolic knots still form an essential part of ceremonial swords to this day. The binding of the royal sword into its scabbard perhaps symbolised the king’s peace throughout the land, while its unbinding might have at times have amounted to a declaration of war. It does not seem inappropriate therefore that such an important feature of the royal sword should be wonderfully enhanced by this fantastic pair of bejewelled gold mounts.